Google starts prompting all existing Google Buzz users to review their existing privacy settings upon launching the service. “Google admit they “didn’t get everything right” and says that you’ll see following screen (see pic) to users who click ‘Buzz’ tab. This page highlights users’ current Buzz settings, which they can promptly confirm or change. 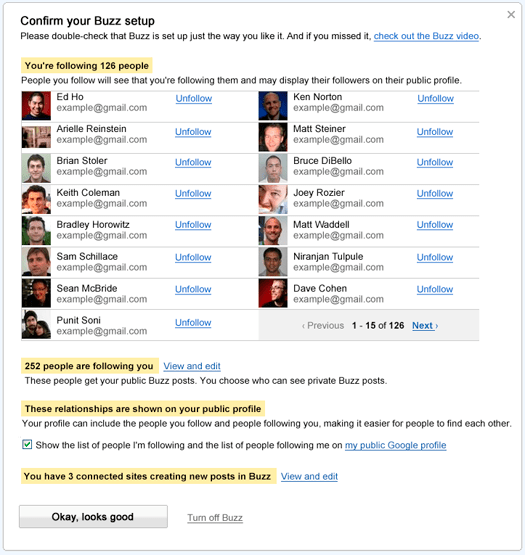 It lets users view and edit the people they’re following as well as the people following them, choose whether they want those lists appearing on their public Google profiles, and modify any of the sites connected to Google Buzz (e.g. Picasa, Flickr, Twitter and Google Reader). Google has also set up a dedicated YouTube channel for Google Buzz, including eight videos explaining the basic concept and specific features.